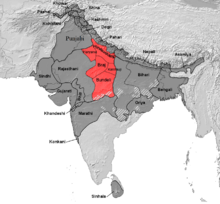 The Central Zone or Madhya are the central varieties of the Hindi Belt of the Indo-Aryan languages. It is a dialect continuum in the Hindi zone spoken across northern India that descend from the Madhya Prakrits. The Western Hindi languages include Hindustani, of which the official languages of India and Pakistan, Modern Standard Hindi and Urdu, are mutually intelligible standardizations of the Khariboli dialect, the prestige dialect of Hindustani. The coherence of this group depends on the classification being used; here only Eastern and Western Hindi will be considered. Bundeli, spoken in south-western Uttar Pradesh and west-central Madhya Pradesh. Hindustani, including the standard vernacular dialect Khariboli (and its standardised forms Standard Hindi and Urdu), spoken in western Uttar Pradesh and Delhi. Awadhi, spoken in north and north-central Uttar Pradesh. Bagheli, spoken in north-central Madhya Pradesh and south-eastern Uttar Pradesh. Chhattisgarhi, spoken in southeast Madhya Pradesh and northern and central Chhattisgarh. Bhojpuri, spoken in eastern Uttar Pradesh, western Bihar, northwestern Jharkhand, the northeastern part of Madhya Pradesh, and in the northern part of Chhatisgarh, it is also spoken in Madhesh, Nepal. It is also spoken by the Bhojpuri diaspora in Pakistan, Bangladesh, Trinidad and Tobago, Guyana, Suriname, Jamaica, other parts of the Caribbean, Fiji, Mauritius, and South Africa. This analysis excludes varieties sometimes claimed for Hindi for cultural reasons, such as Bihari, Rajasthani, and Pahari. Bombay Hindi ("Bombay Bat"), the dialect of the city of Mumbai (Bombay); it is based on Hindustani but heavily influenced by Marathi. Technically it is a pidgin, i.e. neither is it a native language of any people nor is it used in formal settings by the educated and upper social strata. However, it is often used in the movies of Hindi cinema (Bollywood) because Mumbai is the base of the Bollywood film industry. Kolkata Hindi, a Khariboli-based pidgin spoken in the city of Calcutta (Kolkata), Shillong, etc. ; heavily influenced by Bhojpuri and Bengali. Caribbean Hindustani is a Eastern Hindi lingua-franca that developed among Indo-Caribbeans, it is very similar to the Bhojpuri dialect of Hindi and to Fiji Hindi. ↑ Hammarström, Harald; Forkel, Robert; Haspelmath, Martin; Bank, Sebastian, eds. (2016). "Western Hindi". Glottolog 2.7. Jena: Max Planck Institute for the Science of Human History. ↑ Hammarström, Harald; Forkel, Robert; Haspelmath, Martin; Bank, Sebastian, eds. (2016). "Eastern Hindi". Glottolog 2.7. Jena: Max Planck Institute for the Science of Human History. ↑ Grierson, George A. (1916). "Western Hindi" (PDF). Linguistic Survey of India. Volume IX: Indo-Aryan family. Central group, Part 1, Specimens of western Hindi and Pañjābī. Calcutta: Office of the Superintendent of Government Printing, India.